Welcome to the LMLK Single-Stamps wing! This wing of the LMLK Museum features a variety of Individual Stamps! 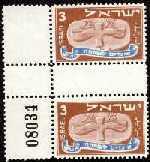 First stamps issued for Israel's 1948 New Year from September 26th, 1948, until September 10, 1949; visit the Postage page of the LMLK Research website for more info! Another philatelic factor is Centering. 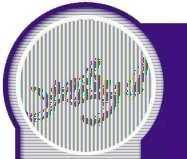 Some were perforated near the edge of the image; others were well-centered leaving an equal amount of white border around the image. 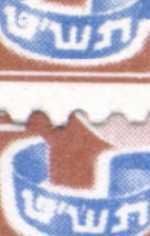 This minor anomalous dot on the printing plate was located over the final Tet in the streamer, indicating these stamps were formerly adjacent to triangular Pane # gutters. 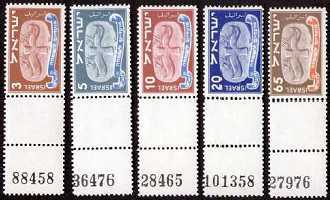 Furthermore, it demonstrates that the same engraving plate was replicated for all 6 panes used with all 5 denominations (colored blue for the 3-, 5-, 10-, 20-mil stamps, & red for the 65-mil). In the photo to the right, one of the stamps from the set offered here is superimposed over a normal specimen without the Tet dot. Note that many of the early LMLK researchers believed the 2-winged icon represented a dove, & some also believed it was a flying scroll (as it was named when these stamps were issued in 1948). Both theories are represented here on this one philatelic gem! 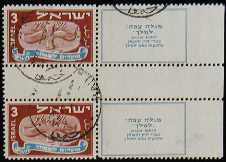 20-mil (Scott #13) with partial Jerusalem cancellation highlighting "USA"
3-mil (Scott #10) Vertical Gutter pair with serial #08034 from supplementary printing! For every 30 Tete-Beche pairs that were printed, only 1 of them had the asterisk slug, but unlike the first printing of 21,000 sheets, only ~3,000 asterisks were printed during the second run. 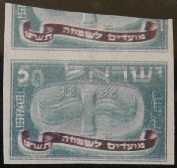 Most of these errors are known on the 20-mil denomination! Made under tight security guard before any other LMLK stamps were printed in August, 1948! Special blue/green color mixture for LMLK seal, & royal purple banner! 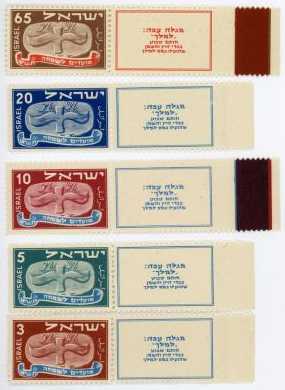 Special mark of guaranteed authenticity by the Society of Israel Philatelists on reverse! 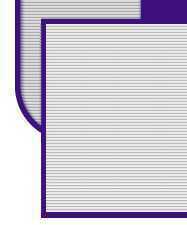 Half of the tabs were 2 1/4" with a color bar strip; the other half were only 2" with a plain white margin. Set with 3 configurations of corner color-bar margins!